What is the most afraid you have ever been? Some people can point to a specific time or place or event that caused genuine terror to result—something like a terrible car accident, an impending surgery, facing enemy fire in a war zone, or having a small child wander off in a crowded mall. Beyond our individual fears, there’s the collective fear that more and more people in our country and around the world know because of acts of violence or terrorism. And not all fear, of course, is generated from external factors. Some people suffer from immobilizing anxiety or fear that keeps them isolated and paranoid, afraid to trust anyone, sometimes afraid even to venture outside their homes. It is easy to read the story of the transfiguration and gloss over the fear that grips Peter, James and John. 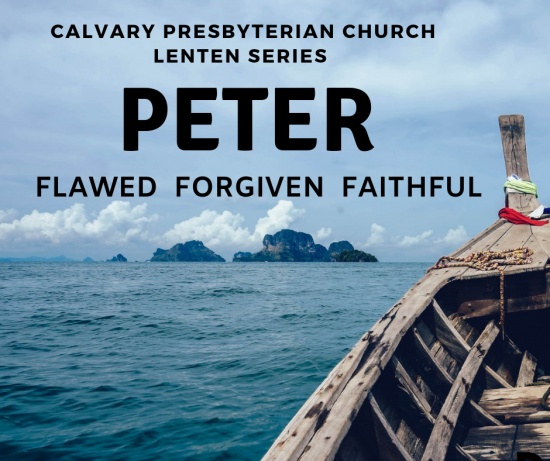 Six days have elapsed since Peter’s bold confession of Jesus as the Messiah and his equally bold but preposterous attempt to tell Jesus how God’s purposes should be implemented—which in Peter’s vision of things would never include suffering or a cross. The disciples have spent these six days walking and talking with Jesus. We forget that Jesus had a lot of time with the twelve as they walked from place to place—time for conversations that are not recorded in the Gospels. Don’t you know they had some fascinating discussions! Jesus doesn’t take all the disciples to the top of the mountain, only Peter, James and James’ brother, John—the “Rock” and the “Sons of Thunder” as Jesus has affectionately called the brothers. There are only two other occasions recorded in scripture when Jesus pulls these three apart from the other nine: when he went to raise the daughter of Jairus, the synagogue ruler, from the dead and on the night of his betrayal, Jesus will take them with him into the Garden of Gethsemane when he seeks solitude for prayer. Just before leaving Caesarea Philippi, Jesus had said, rather cryptically, “I assure you that some standing here won’t die before they see the Son of Man coming in his kingdom” (Matthew 16:28). Now, Jesus takes Peter, James, and John to a mountaintop which is significant not just as a place set apart, but also as a place of perspective, wonder, and possibility. From here they can see the whole world as they know it, and they are primed for revelation, for catching a glimpse of Jesus “coming in his kingdom.” And that glimpse is extraordinary. They see the glory of God on the face of Christ. Suddenly they also see Moses and Elijah, Israel’s greatest lawgiver and its greatest prophet, who appear with Jesus, speaking to him. Finally, they hear the voice of God affirming that Jesus is in fact more than a lawgiver and more than a prophet. He is God’s dearly loved Son. Jesus’ first instruction to the disciples is simple and clear: Get up! While still overwhelmed with fear and confusion, Jesus gets them on their feet, literally and physically. Getting out of a physical posture of fear and into an upright posture prepared the disciple’s minds and hearts to follow their bodies, and there is great power and wisdom in that. After my father died, when the funeral was over and all the out-of-town company had left and the locals had gone back to work and to their lives, my mother and I were alone in the house. For a couple of days all I wanted to do was sit in my dad’s favorite chair and cry. But my mother said, “I’m going to do one ‘normal’ thing every day. I don’t want to, but I’m going to make myself get up and do it until eventually, maybe something will begin to actually feel normal again.” Jesus knew that one of the strongest antidotes to fear and inertia is to get up and get moving. After Jesus hoists the disciples up off the ground and tells them not to be afraid, he moves them down the mountainside. They do not stand around contemplating what they’ve just seen and experienced. They are instructed to come down. Fear often triggers a “fight or flight” reaction in us. Jesus, I think, does not want Peter, James, and John to turn their fear into anger—the fight response—or to flee from their responsibilities because of this extraordinary mountaintop experience. You can already see Peter leaning in that direction. He’s ready to take up residence on the mountaintop and who can blame him? He wants to prolong the glory, to bask in the glow of the spectacular, to live above the fray of “common life.” But Jesus won’t indulge it. Neither fear nor fascination should keep us from returning to the ongoing ebb and flow of life. Even if, in the short run, we don’t feel normal, even if it seems we are just going through the motions, Jesus calls us back into the fray of everyday life. When I find myself in this kind of situation, when I’m feeling perhaps out of rhythm or there’s a disconnect between head and my heart or my body and my emotion, I find it extremely helpful to simply identify and then do “the next right thing.” Do the next thing that is in front of me, the next task, the next obligation, the next chore. It is almost miracle-like how continuing to navigate my way through my responsibilities re-sets my perspective, changes my mood, and frees me to move through whatever difficulty I am in. Jesus’ fourth and last instruction is to yell about it. Here is proof that Jesus is not outlining a short course in denial, sublimation, and repression. After shaking free from fear, re-entering life, and contemplating life’s mysteries, Jesus declares that there will come a time to shout about it. For Peter, James, John and the other disciples, that time will not come until after Jesus’ crucifixion and resurrection. It will be then, looking back through the lens of Jesus’ suffering, death, and rising that they will recall the wonder of the Transfiguration and shout to the world that Christ is alive; that there is glory that lies beyond our suffering; that Christ is present and here, in the midst of this and every mystery. Let me be employed by you or laid aside for you.